Donald Boothby, a Seattle randonneur, died of cancer this past week. I did not know Donald well, but he left such an impression on me during the 2006 edition of the Cascade 1200K, that I wanted to share the fond memories I have of him. One of the best things about randonneuring is the people you have the chance to meet. 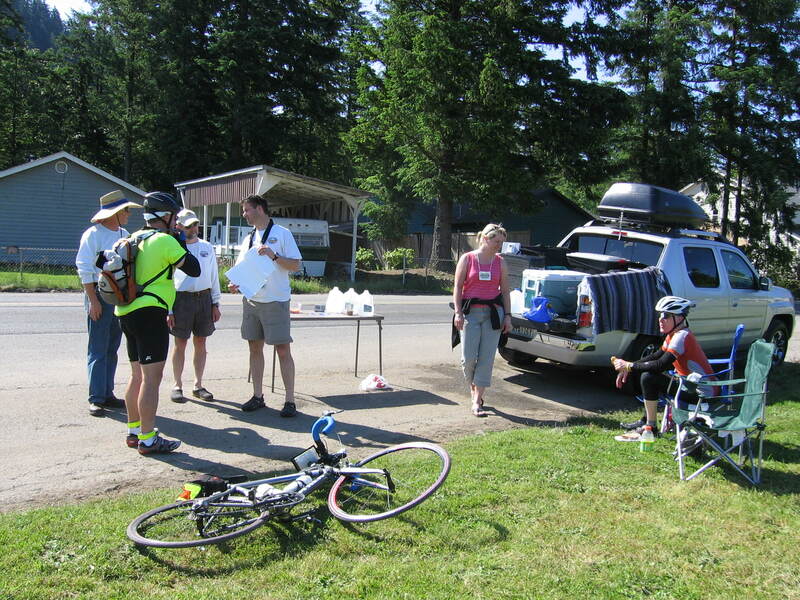 In 2006, I embarked on my first grand randonnee (on tandem with Felkerino), the Cascade 1200K. I’ll never forget that ride: the whole new experience of the 1200K distance; the heat; fellow riders from all parts of the country; and the incredible volunteer support provided by the Seattle International Randonneurs. Among the volunteers on that ride was Donald Boothby, an avid randonneur and tandem rider. Donald, like many of the volunteers, followed the randonneurs through the 90-hour course and helped out by providing food and water along the way. Volunteering on a 1200K is an intense experience, as arduous as the ride itself, only you don’t get a medal at the end. Donald provided the best encouragement to Felkerino and me. We rode most of the 1200K just inside the control limits, ultimately finishing in 89 hours. It was the hardest ride I had ever done, and with the uncharacterisctically hot temperatures, I wrestled with my doubts that Felkerino and I would officially complete the ride. Every time I saw Donald, he said that we were doing great. “Wonderfully,” I remember him saying. “Winning the tandem division.” (We were the only tandem.) The way he spoke always reinstilled my confidence. To combat the heat, Donald gave me a little toy fan that he said would really help me out in the stoker zone. I’m not sure it helped with the heat, but it made me laugh and kept me moving forward. On the third night of Cascade, our rear wheel detensioned and our front tire flatted. That required us to install a new wheel which we had brought along “just in case,” as well as change our front tube. We decided to wait until the following morning to mess with the bike and instead, banked 90 minutes of sleep. When we awoke on the final day, Donald had already put our tandem in his workstand and made us espresso while Ralph Nussbaum and Jeff Bauer went to work on our wheels. Quicker than quick, we were up and on the bike again, with Donald’s espresso running through our veins. It’s remarkable how people’s belief in you and willingness to help can fuel your body and mind. In that moment, I knew Felkerino and I were going to successfully finish our ride. Whenever I look back on Cascade, I remember how much the Seattle volunteers helped and encouraged us. I recall Donald Boothby’s thoughtfulness, his ever-positive spirit, and his belief in our tandem team. Like I said, one of the best things about randonneuring is the people you get to meet. I feel so fortunate to have met Donald, and I’m sorry I won’t get to see him again. Beautifully written; it brought me to tears. A lovely story–thank you! I’m struck by how important a few words of encouragement on a 1200k can be. Your kind words after day one of HC1200 really did help! Given recent events in my household, I needed a boost. MG you are my Donald Boothby today with this post. I recall my first marathon in Newport RI and hearing a local running coach, encouraging the runners out among the rolling hills and cold winds from Rhode Island Sound as we plugged away along Ocean Drive. “Relax. Keep it smooth.” I thought what a nut! It’s cold out here! But I just repeated those words in my head for the rest of the run. Then the wall of cheering people as we entered downtown Newport about 21 miles in. It felt like a tailwind! Of course, I did hit the legendary wall but with 3 miles to go, the finish was guaranteed. All I had to do was relax and keep it smooth. he regretted not being able to volunteer for this again, he loved the whole experience. Yes, that was me! It was such an unexpected surprise after that section on the Rattlesnake Hills. Donald totally understood that the stoker zone is even hotter than the captain’s. THANK YOU so much for posting that video. There are not many videos of Donald from before he had cancer. Yours is one of the best. It is a part of our family archive now. I was there too, and every word is true about Donald’s 1000% support at the Cascade 1200. We will miss him so much. Thanks–that was lovely, and so very Donald-like. He is going to be sorely missed. Donald’s welcoming friendliness will never be forgotten in my soul. A total stranger / member of a cycling website living in Saskatoon. had the opportunity to visit Seattle in 2010. So badly wanted to ride so posted questions asking where to go and a bike. Well not only did Donald reply. But he welcomed me , picked me up, lent a bike of his and spent two wonderful evening riding our hearts out in the Seattle area. One night with his friends and the other on our own. A visit with a stranger of a lifetime. Who to me I will always remember as a best friend. A blessing to have met Donald. Along with John Canning from Semanish Valley cycle who by fluke moved to Saskatoon and is working in the same Bike shop I am in Saskatoon. I found a photo of Donald where he is wearing a sticker that says “Ride Organizer” and it’s from the cascade 1200 ride. If you want it, drop me a line. Oh I remember Donald a lot and truly miss him. Not sure what the year was but something like 2005 or something like that. Don meet me at the airport and took me to his house and left me stay there with me being a total stranger. I can proudly say I introduced him to Bikejournal.com on that trip and he was the life of the forum along with a Pansy Palemento and there was plenty of banner going on between them. I DNF(did not finish) on that ride and then went with him on the course to help encourage other riders on. What he didn’t wasn’t within the rando rules maybe helping riders out between control stops but then on another point he was helping the riders out. That was just Donald and I am good with that as riders safety is always a concern on these long rides. Fast forward a couple of years and yes Donald left me stay at his house again. I got lost the last day of the ride and me and another rider were almost to the point that we weren’t going to finish in under the time limit. I think it was around 1 Am or 2 AM in the morning and Don was out on the course yelling GO ZMAN GO. I will never forget this about Don and the way he encouraged every rider. The other rider and I had to time trial in for about 20-30 minutes and I was so smoked at the finish line they had to pry me off the bike. Don help me pack my bike out as I was so exhausted and took me to the airport that same morning around 5-6 AM. That was just Don. Yes I truly miss him as I would be hard pressed to meet a better friend. Oh year one time at the Tour de Tuscon he was baking pies at the one gals house for some of the riders that showed up. He was to make me a cherry pie and baked a strawberry/rhubarb pie just for me since I couldn’t make the meeting flying in from Pa. for the ride. We always teased each other about that and for sure if you were around Don there was never a dull moment.